Multi-award winning Fantasy author, Doctor Who commentator, PhD owner, caster of the pod Galactic Suburbia, and newly minted crime author, Tansy Rayner Roberts is one of the leading voices of the Australian Speculative Fiction Scene. I had a chat with her about her new novel, A Trifle Dead, the location of Wonder Women, the ups and downs of TV re-watches, and sassy crime. 1. 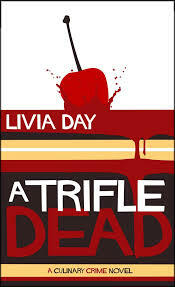 So tell us about your new novel A Trifle Dead and your new writerly persona, Livia Day! A Trifle Dead is a culinary crime novel – delicious food, good coffee, cute frocks and okay, the occasional gruesome murder. Livia is my way of separating the fantasy fiction from the crime, though I’m not entirely sure it was the best plan considering I now have to run around telling everyone that the lady who wrote that book with the blood-stained trifle on the cover, SHE’S TOTALLY ME BTW! Not exactly a switch, as I haven’t stopped writing fantasy at all, but I’ve always loved the crime genre and wanted to write both. And I LOVE the description sassy crime, I am totally stealing that. It’s much nicer than Chick Lit Crime, which is so 1998. 3. What was the inspiration for the character Tabitha Darling? Who did you want her to be? I wanted a protagonist who uses social skills and cake to solve crimes, because really in a small city like Hobart, it’s so hard to keep a secret. Gossip is not just a weapon in the hands of sweet little old ladies, it’s also a major currency among hipsters and party animals. Tabitha’s the sort of person who is fun to be friends with because she makes you feel special when you hang out with her – she’s not magically beautiful or perfect, anything but. She has a personal style, though, which is enticing and flattering. She’s genuinely interested in people, and in vintage fashion, and feeding people, and until the events of A Trifle Dead, she never considered playing Girl Detective … but all those skills of hers are going to come in handy. 4. 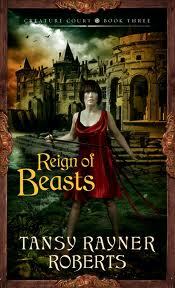 Your Creature Court Triology was fabulous and very well-received – any plans to follow up on any of those characters? I love the characters of Creature Court dearly, and I put so much work into that world – especially the festival calendar which seriously kept me up at nights. I’d love to go back there, and I would be lying if I said I hadn’t put a few seeds in there that could sprout at any time. But I’m also really happy with it as a complete trilogy, and very proud that I ended it so thoroughly. If I do go back there, it will be after a long break both in the narrative of the story and in my own life. I’m not feeling the compulsion right now, and sadly no one is beating down the door to commission a sequel. But if the interest was there and I felt sufficiently recovered … oh yes, I have a few ideas. 5. Your wonderful Twelfth Planet Press novella Siren Beat introduced a wonderful protagonist in Nancy Napoleon and I understand you’re writing a full length work featuring her? I wrote it! I am shopping around Fury (or possibly Fury Dance, since someone else stole my awesome title) with publishers and agents at the moment. 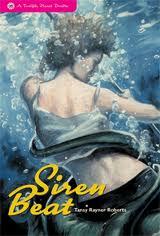 I’d love to sell this series, Nancy is a character I am thoroughly invested in, and the reader/critical response to Siren Beat has been overwhelmingly enthusiastic. All it needs is someone publisher-shaped who is willing to support an urban fantasy series set in Australia and unfortunately I have not yet found that special someone. 6. Love and Romanpunk was a huge success and a really, really clever book – a perfect blending of intelligently re-purposed history and fantasy. Thank you! I like to think of it as my fictional response to my doctoral thesis, which sounds terribly dry and boring, but it’s quite the opposite. It’s every stifled creative impulse that I had back then, every longing for dialogue instead of footnotes. It’s also very much the book of my heart, and it makes me happy every time I hear of someone having enjoyed it, because a slender volume of short stories is not always going to catch the notice of general readers. I have to share the credit for it with my publisher Alisa, though, at Twelfth Planet Press. She’s the one who rejected half the book, and singled out “The Patrician” and “Julia Agrippina’s Secret Family Bestiary” as the stories that were doing something interesting enough to construct a whole story suite around. Also, of course, having been commissioned for the stories in the first place. It was a time in my life when family and publishing commitments were at an all time high, so I wouldn’t have found the writing space in my schedule to get these stories down on paper without that support and encouragement. 7. You’re a great re-watcher of the likes of Xena and Dr Who, posting your observations and analyses about the programs. Do you find sometimes that re-watching stuff you loved as a child is a bit of a letdown because sometimes our younger memories should be left alone? I think that can definitely happen, and we shall NEVER TALK about the crushing disappointment I felt upon, for instance, re-watching Battle of the Planets. But I have a superpower of appreciating things which other people think of as cheesy or old-fashioned, and I am pretty loyal when it comes to all things Xena or Doctor Who. The important thing is that you can love something and critique it, because even appalling mistakes can be fascinating. Xena is particularly intriguing to me as someone with an interest in the behind the scenes story of television, because it bridges the gap between old-fashioned TV drama and the more modern style – so it starts out in a place where arc-based television is rare and unusual, and ends in a world of season finales and episodes that bleed into each other consistently. It also has this weird handling of the central relationship, where they started playing a colossal game of chicken as to whether the slashy fan readings of the Xena/Gabrielle relationship were accurate or not, to the point where some episodes only make sense if you believe they are romantically in love, and others only make sense if they are not. 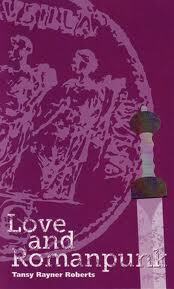 But beyond all that historical scholarship stuff, I love Xena unironically. I watch it for fun. It has its guilty pleasure aspect for me, notably in its appallingly cavalier attitude to historical timelines (everything BC is good), but I wouldn’t have invested in the giant 6 season box set of DVDs if I didn’t love it. Doctor Who is kind of different, it’s in my bones. I was raised appreciating it, again unironically. My mother was very into theatre when I was young and her approach to TV watching was always to look at how it was made as well as what the story was – which has the benefit that I never cringe about dodgy special effects or monster masks or whatever. I don’t need to suspend my disbelief to enjoy it – EVERYTHING DOCTOR WHO IS GOOD. Even the Taran Wood Beast. 8. How did the Galactic Suburbia podcast come about? How do you all choose your topics/books/discussion points? Alisa, Alex and I had been working together and communicating in a friendly fashion on the internet for a long time, but the idea of extending that via Skype to a regular conversation was really enticing. Alisa and I listened a lot to The Sofanauts, which at the time was a great, relaxed and conversational podcast about the industry. When Tony C. Smith stopped running it, he did suggest someone else take it over and we considered making an offer before we realised that if we did a conversational podcast about the industry, it would be SO DIFFERENT to that, it would be all about the female perspective and female voices, so we didn’t want someone else’s brand. We created Galactic Suburbia instead. The name is from a Joanna Russ quote. Our system is simple – we have rotating hosts whose job it is to keep everyone else on track. We all drop relevant news links to discuss into a Google Doc that’s shared – sometimes a few days ahead, but more often on the day itself. The Culture Consumed section is based on our own personal reading. For the first year we did have themed pet topics every episode, but we ran out of steam with that and also found that the three act structure made for too long a podcast – we are capable of talking for an hour about like three news items, so we don’t need the encouragement to go too long! Most recently, we’ve changed up the format a little because Alisa’s work as a publisher doesn’t allow for the same level of leisure reading that Alex and I can manage, and she’s about to leave her dayjob to start her PhD in publishing, so she’s going to be documenting that lifestyle change through a kind of diary entry segment of the show instead of her share of the Culture Consumed section. It will be a record of this major year in her life, and we’ve always had positive responses from listeners when Alisa talks about the indie publishing business from the inside. Her ‘money for jam’ speech about how easy it’s supposed to be to knock out e-books has gone down in podcasting history, so we’re looking forward to what this year brings for all of us. 9. What inspired your series of posts “Where the Wonder Women Are”? It was actually a panel that I did at a convention – the title was Where Are the Wonder Women, and I got into an argument about whether there are in fact a lot of awesome female superheroes. WHICH THERE ARE. Just because they are treated badly and not necessarily in books right now doesn’t mean there isn’t a long history of women in superhero comics who are genuinely interesting characters. So I started making lists and documenting many of my favourites – it’s half comic book history, half personal memoir. Sadly many of the essays have depressing endings, because I spend 2000 words showing the potential and fun backstory of a particular character and then have to finish up with ‘but then they killed her off stupidly’ or ‘but they haven’t put her in a book for ten years for no good reason’ or my personal favourite ‘but then the New 52 happened and no one’s seen her since.’ But I think it’s an important thing to be writing about, to show this history of how female characters in superhero comics have been treated, and that there is this wealth out there of IP with great potential for feminist awesomeness. The good news part of this is that Marvel have taken a lot of the criticism of their gender politics to heart and have spent the last year announcing many, many titles of not only comics featuring women, but many team books in which the female characters outnumber the male. So I have had some happy stories to report in my essays too – and other cases where I write one of my essays with a depressing ending, then Marvel makes an announcement and I have to go back and add a note saying ‘look, I was wrong, hooray!’ which is like, the best possible way to be wrong. Something else I’m trying to do without being too overt about it is to make sure that the female characters of colour are well represented in my series too. My rule of thumb is to have at least one non-white character for every five, though I am trying for a better ratio than that. So far my big disaster was writing a whole essay on the new Captain Marvel without realising that there was a female Captain Marvel before, and she was a black woman. So rather than going back and amending that essay, I am going to do a whole separate essay on Monica Rambeau, because she deserves her own space. There will be at least 75 when I’m done, and I’m starting to suspect that the list has to be longer, though I am resisting that. 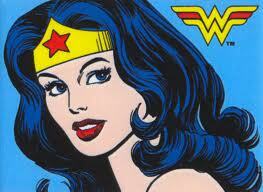 The final one on the list, of course, will be Wonder Woman. 10. Your favourite Doctor Who companion and your favourite Wonder Woman? The idea of one favourite Doctor Who companion boggles my mind. I can never pick just one. 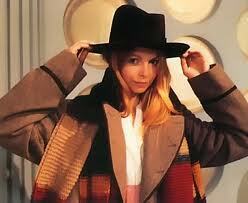 But today it is Romana. My favourite Wonder Woman is the version from the animated DCU, who is most consistently the Wonder Woman who exists in my head. I like the version from the animated Wonder Woman movie especially, but she’s good across the whole Justice League and Justice League Unlimited series. I’ve never found my perfect Wonder Woman series in comics but again the Wonder Woman who feels most like mine is from the Justice League, in this case the pre-Crisis early 80’s Justice League. AFTER her weird karate Emma Peel phase. This entry was posted in News, On Publishing, On Writing: General, On Writing: The Novel, Pimping/Promoting! and tagged a trifle dead, livia day, tansy rayner roberts, the creature court, twelfth planet press. Bookmark the permalink. I love the Creature Court trilogy, and Love and Romanpunk, (although that one did give an odd subtext to my subsequent ancient history homeschooling). I wish Livia Day and Tabitha Darling every success! Cheers! It’s a fabulous book – yes, I’ve read it! 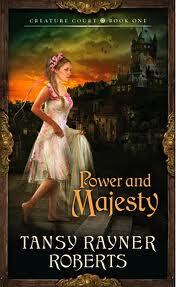 Great fun, snappy writing, terrific pace.